When I went to see the Film Festival in Wellington last July (which featured Chasing Ice) I got to ask a question about climate change research about Antarctica. Nobody really had any definitive knowledge to impart. Reading about methane release in the Antarctica I did a search to see if anything like this was happening in Antartica. All I could find was a You Tube video about some Argentinian researcher and a video from a Japanese spiritual group. That has changed in recent months, and more has been coming out about Antarctica. Firstly, that while the Arctic was shrinking, the ice shelf of the Antarctic was growing in extent. 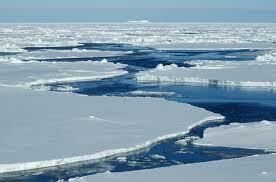 British research showed that Arctic ice was disappearing at 5 times the rate that the Antarctic was increasing. Subsequent research has shown that the ice shelf is, indeed melting. especailly on land. The Antarctic ice shelf is melting from underneath. Since then there has been information that the Antarctic half of the thermohaline circulation is slowing down. There is also data showing the release of methane from the Antarctic. Here are some items relevant to the Antarctic. They are in reverse chronological order. Ocean waters melting the undersides of Antarctic ice shelves are responsible for most of the continent's ice shelf mass loss, a new study by NASA and university researchers has found. High levels of methane over Antarctica were recorded before in 2013....Are these high methane levels indications that global warming is breaking up the integrity of the permafrost in Antarctica as well? The global oceans' coldest water, Antarctic bottom water forms in several key spots around Antarctica. The water is so cold and dense that it spreads out along the bottom all of the major ocean basins except the north Atlantic and Arctic. 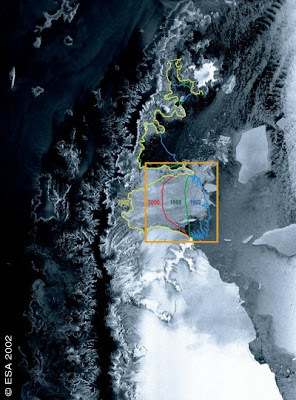 Multiple recent reports provide strong evidence that the formation of Antarctic bottom water has slowed dramatically in response to massive subsurface melting of ice shelves and glaciers. 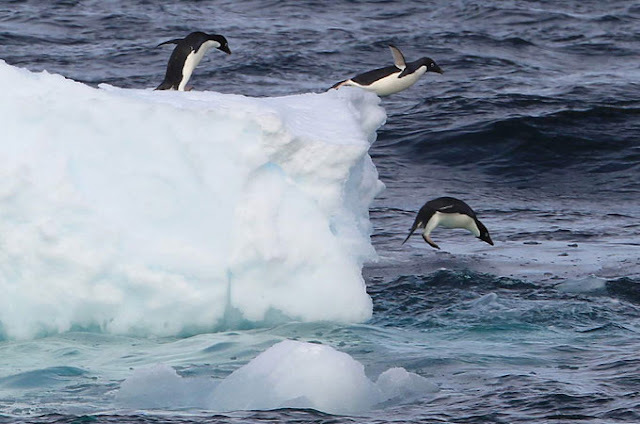 The hole in the Antarctic ozone layer has caused changes in the way that waters in the southern oceans mix, an international study shows. West Antarctica is warming almost twice as fast as previously believed, adding to worries of a thaw that would add to sea level rise from San Francisco to Shanghai, a study showed on Sunday. 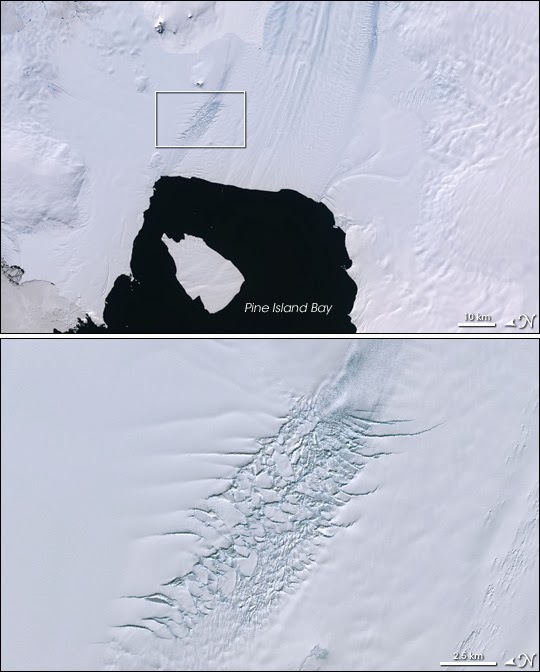 With its protective sea ice barrier melted away, Antarctica's Pine Island Glacier grows ever closer to finally dropping its New York City-sized iceberg into the ocean, according to NASA. 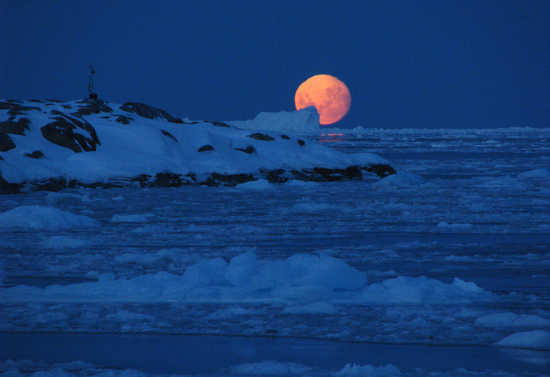 The steady and dramatic decline in the sea ice cover of the Arctic Ocean over the last three decades has become a focus of media and public attention. At the opposite end of the Earth, however, something more complex is happening. A new report in Nature released Wednesday says that on the Antarctic Peninsula, at least, human-generated greenhouse gases have almost certainly been by far the most important driver of warming over the past half-century. 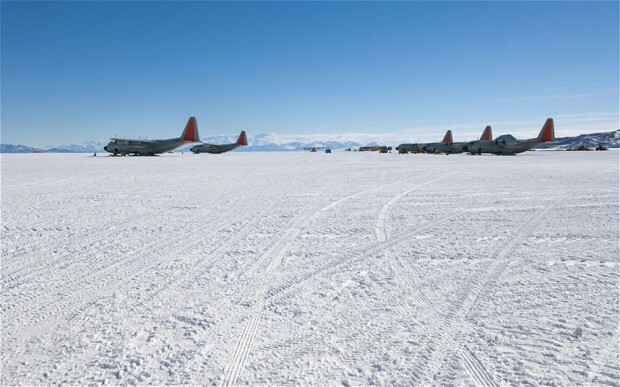 A vast reservoir of the potent greenhouse gas methane may be locked beneath the Antarctic ice sheet, a study suggests. 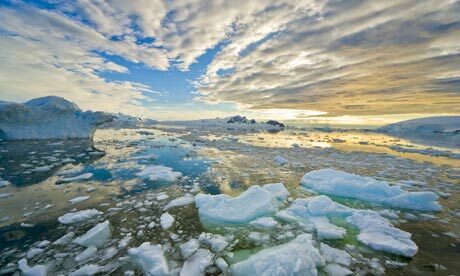 Scientists say the gas could be released into the atmosphere if enough of the ice melts away, adding to global warming. 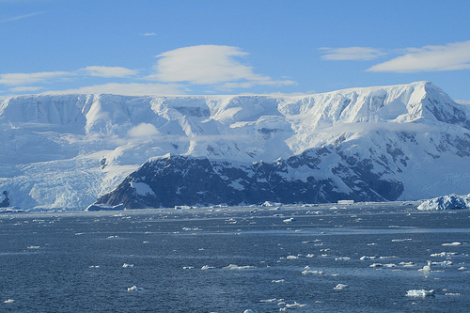 Warm ocean currents attacking the underside of ice shelves are the dominant cause of recent ice loss from Antarctica. 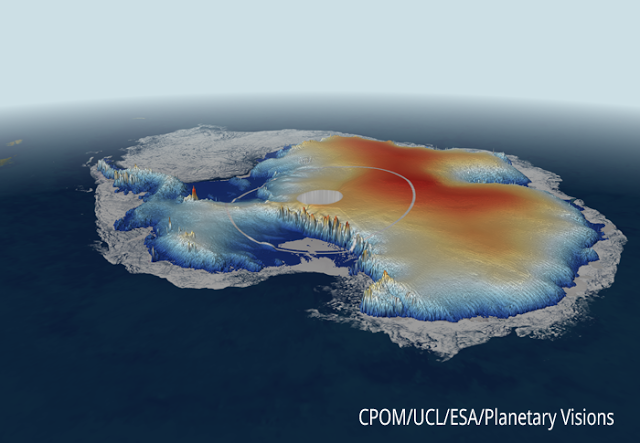 This animation shows the circulation of ocean currents around the western Antarctic ice shelves. The shelves are indicated by the rainbow color; red is thicker (greater than 550 meters), while blue is thinner (less than 200 meters). Scientists have warned that the balance of Antarctica’s ecosystem might be threatened by the alien plant species brought to the region by tourists and scientists. On October 14, 2011, NASA scientists spotted a major rift in the Pine Island Glacier, a large ice stream in Antarctica. At the time, the crack was about 18 miles long, OurAmazingPlanet reported. A satellite image taken on Nov. 13, 2011 (shown below) revealed a crack that was 19 miles long, 260 feet wide, and 195 feet deep. For the first time, scientists have documented an acceleration in the melt rate of permafrost, or ground ice, in a section of Antarctica where the ice had been considered stable. The melt rates are comparable with the Arctic, where accelerated melting of permafrost has become a regularly recurring phenomenon, and the change could offer a preview of melting permafrost in other parts of a warming Antarctic continent. They are indeed melting and the misinfo on this subject is staggering. A reason to pay close attention to Manchester? Did the Simpsons predict the Notre Dame fire? Memo to POTUS: "The Fly in the Mueller Ointment"